DO-35634-30 was succesfully added to your cart. Waterproof pHTestr 30 is great for outdoor applications such as taking pH measurements in lakes and streams. Designed to float in water, you can even attach a line to the housing for easy retrieval. Valox sensor housing resists most chemicals. The pHTestr 30 has a replaceable sensor for easy maintenance. Double-junction electrode sensor handles wastewater and solutions containing sulfides, heavy metals, and TRIS. Electrode sensor offers a clog-resistant Kynar® junction and a recessed, glass pH bulb to protect against breakage. The keypad clicks to confirm operation, and allows access to a variety of functions. Calibrate up to three pH points with the auto-buffer recognition at both USA and NIST standard buffers. Additional features include a automatic temperature compensation (ATC), hold function, auto-off function, self-diagnostic error messages, and a three-segment battery-life indicator. Meter includes: protective plastic storage case, lanyard, and batteries. Can this product be used for testing the PH level during Yogurt formation ? This pH tester has a double junction sealed electrode. For measuring yogurt and cream-type products a pH electrode with a low resistance pH bulb with a double junction design with an outer chamber that is refillable will be best. Using a handheld meter with a glass refillable electrode would be more accurate in measuring yogurt. Hi, we have a 35634-30 ph tester and need to know which calibration solution we need to buy for this unit. Which one do you recommend for us? PH 4, 7, and 10 buffer is recommended for this tester. I would recommend the buffer pack 05942-10. Can this tester be used to test food? If so, what accessories must I buy in addition to the unit, and what is comes with the tester out of the box? This pHTestr will incorporate a double-junction electrode design, which would protect the porous plug from direct contact with the particulate/solids in solution such as food. We do suggest that the food be sampled from the container and tested, rather than directly testing within the batch, as the electrode will include a fragile glass bulb. With this being said, the pHTestr 30 should be appropriate for the application if properly calibrated, cleaned, and maintained. The only other accessories I would recommend would be a buffer pack for calibration, cleaning, and storage such as item 05942-15. How and what solution should the Oakton Ph Meter 30 be stored in when not in use? Usage is 1-3 per week, maybe less. A pH 4 buffer is ideal, tap water is also acceptable. This unit does not calculate slope and it would need to be calculated manually. The millivolt slope is determined by the difference between the millivolt readings when the probe is placed in different buffers. For example, if in buffer 7 the millivolt reading is -10 and in buffer 10 it read -177, then the slope is -177 minus a negative 10 for a difference of -167 millivolts. The millivolt slope must be between an absolute value of 165 and 180 millivolts between buffers 4 and 7 or between 7 and 10. Checking the sensor's slope will keep you aware of the probe's status and when it is time to consider replacement. When the pH slope calculation is showing that the slope has dropped to the 165 mvrange, replacement is necessary. Ideal mv Values : Buffer 4 = +177 +/- 50mv, Buffer 7 = 0 +/- 50mv, Buffer 10 = +177 +/- 50 mv. Is this product capable of storing data sets? If so, how many? The meter will store calibration values but will not store measured data. Is this meter approved by EPA for wastewater ? Asked on 1/6/2015 by Larry from Ashford, Al. EPA does not approve specific products by brand or model. The method for federal or state EPA should be reviewed for recommended procedures. The primary requirements for pH is the meter should have ATC (Automatic Temperature Compensation) and the ability to be calibrated against known standards. The 35634-30 fulfills both. Can this be used to test the Ph of DI water? Because it's deionized water, adding 1-2 drops of approximately 3.5M KCl to the sample can help the stabilize the meter more quickly. Use reagent grade KCl to avoid impurities that may affect pH. Yes, it can be used to test DI water. Pure water sometimes requires a little longer to stabilize, but it will still register. Can I calibrate my pH meter Oakton pHtestr 30 in tap filtered water? Can you show me how to calibrate it with tap water? The pH meter needs to be calibrated in a pH buffer in order to ensure good results. Tap water can have a variable pH and is not suitable for acting as a comparison standard. Can I use my pH meter pHTestr 30 in a substance that contains oil? This substance contains vinegar, water, red chili pepper, spices, and oil of course. Will it get clogged eventually or not? will the reading be inaccurate or altered? The Oakton pHTestr 30 has a replaceable double junction sensor. The double junction is designed to handle 'dirty' samples and resists clogging. The sensor also offers a clog resistant Kynar junction. To ensure accurate readings over time make sure the sensor is cleaned after every use. As a Pretreatment inspector I need a reliable and easy to use instrument for field testing. 3 buffer calibration capability is a must as is the rugged probe. Once you get the hang of the calibration (you do have to wait the full two to three minutes between buffers) its very simple to operate. it does have to be kept wet (in electrode storage solution) between outings or the probe will fail. this is the worst ph pen i have ever had in my 30 yeard of hydroponics. This is the second pen and it has the same problems as the first PH30 pen. It will not calibrate past a 2 point level and the readings are off by as much as 2 points when a simple one point calibration is attempted. Do not rely on this pen for any accuracy whatsoever as it will ruin your garden. What reads 6.0 on the Oakton Ph30 was actually 2.9 on a cheap Milwakee backup pen. Thank goodness for the back up pen. 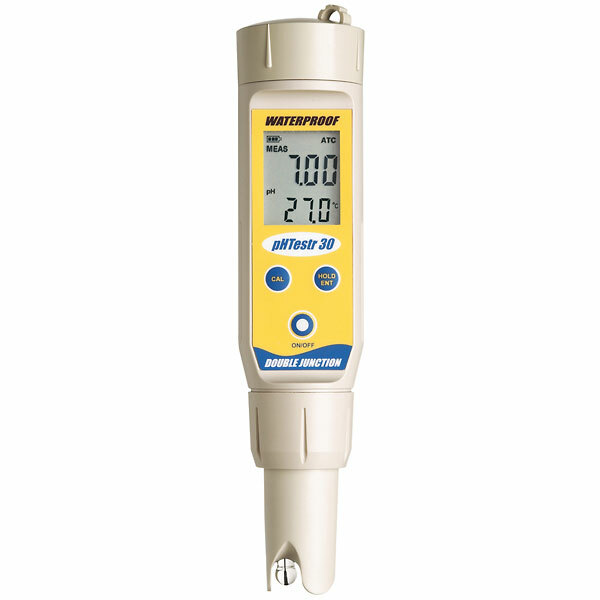 Great pH Meter. Con pH element has to be replaced from time to time, but that is true with all pH meters reguardless of maker. pH 30 gave great reading, but user must read instructions and learn to use the meter. I have owned the pH 30 for Six years and have replaced the pH element twice. I would purchase this pH 30 Meter again. I found it difficult to calibrate the temperature accurately. Also, the calibration seem to go off to easily just a day later. Not sure if I can trust the reading on the same product on the next day. It would be good to have a help line to call when using the device to ensure is being done properly. Great little cost effective tool! As a Water Lab Technician in Baghdad. It fell to my department to test potable water systems daily for the US Military. Our crew was primarily low skilled workers from various countries with little to no English skills. These meters were perfect for that environment. The only problem we ever encountered was in changing the electrode. It is critical that it be done in a dry environment and that the seal be set just snug. Over tightening would cause the seal to leak thus ruining the electrode and the meter. Once the seal is snug a perminant marker line across the joint will give you a visual reference that the seal is still in proper position. JUMPS THROUGH ALL THE HOOPS I NEED IT TO! We use 15 of these for 3 weeks in the field each summer. Completely untrained students use them on streams, and we intercompare results. The mean difference is 0.10 pH units and the median 0.065. I consider that to be excellent. After 4 years we had to replace all of the electrodes, perhaps because they sat dry most of the time, though this is recommended storage by the manufacturer. used in the field every day in an industrial setting and it's been the most reliable meter we've had over the years. Our first one lasted three years and we will buy another one. Excellent for use in the field or lab. Very durable. Very accurate. Quick response. So portable, it can be carried in your pocket. By Frank "The rodent microbiologist"
I use this product to check the Ph of Laboratory animal drinking water(Rodents). The Ph of the animal drinking water needs to be in the 2.0 to 3.0 range . The PHTESTR 30, WATERPROOF, DJ, WITH TEMPERATURE READOUT pHTestr works very well in this range.